Rubus pensilvanicus is an arching, prickly shrub to 3 m tall, colonial, stems stout, prominently ridged. Much like R. allegheniensis but stems of inflorescence without glandular hairs. Leaves alternate, palmately compound, 5 leaflets, terminal leaflet egg-shaped, about 15 cm long, widest at or below middle, margin toothed, thorns of leaf stalks and midribs hooked. 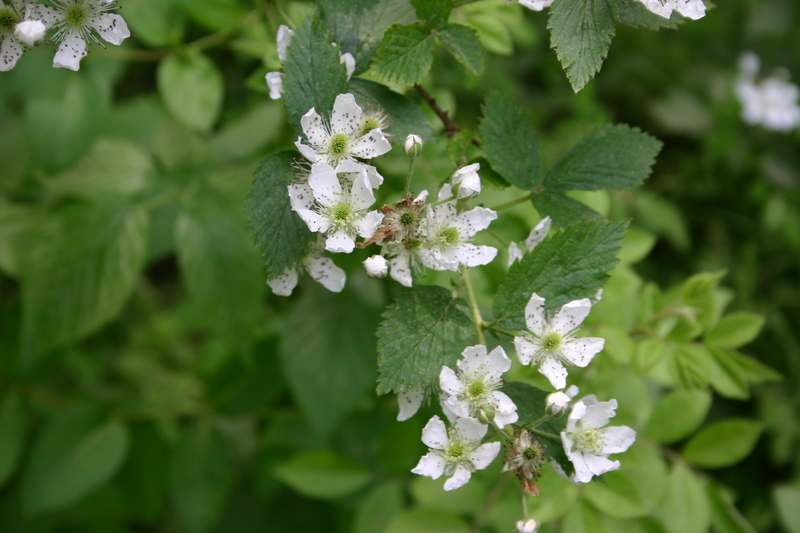 Flowers white, 2 cm wide in racemes on new growth branching off of primary stems of the last season. Fruit fleshy, of multiple 1-seeded black drupes (unripe fruit red) adhering to receptacle, shiny, June-Aug.